As the college year gets closer, so does the events that follow! We start with Freshers Week to welcome and celebrate all the new students arriving into NCI, and the SU wants to make them feel as welcome as possible. 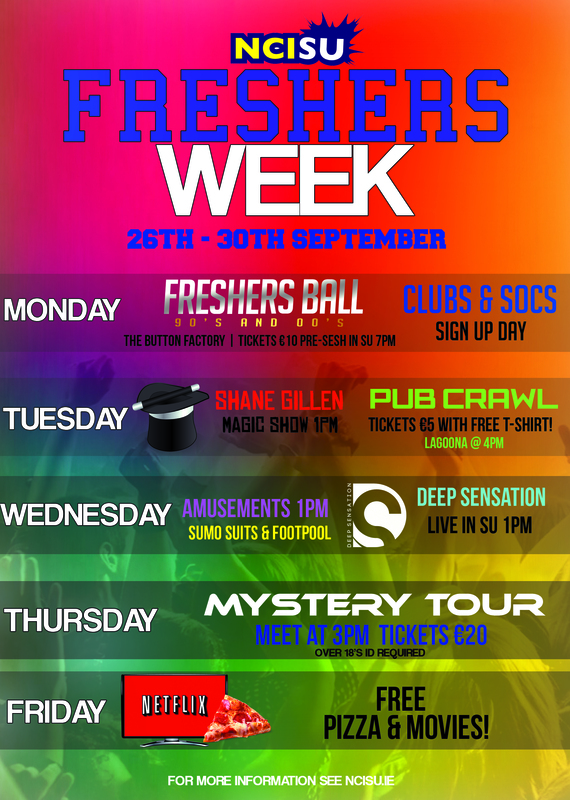 All these events will be during Freshers Week which starts 26th September until 30th September. All the events will be held as shown in the poster. Tickets limited to availability, so hurry and get yours now! Mystery Tour and Freshers Ball Strictly over 18’s, GOVT ID Required. NCISU Promotes Responsible Drinking. ← Welcome Freshers of the 2016/17 Year!